Celebrating launch of Wild Women! Couldn't be more chuffed to have a chapter of my book 'Alone in Antarctica' included in this new anthology of travel writing edited by Mariella Frostrup. Other authors include some of my all-time heroes; Gertrude Bell, Mary Wollstonecraft...as well as modern-day heroes like Lois Pryce, Junko Tabei and even some names I haven't come across before. The book is yet another demonstration that women have always been explorers and adventurers, we just don't celebrate them nearly often enough. I went along to the book launch in London last night and met five of the other living contributors to the anthology; Christina Dodwell, Lois Pryce, Catherine Fairweather, Bella Pollen and Josie Dew. Even if I wasn’t in it, this book would be a joy to own. It will certainly sit proudly on my bookshelf at home ready to be used anytime I am in need of some extra motivation. Years ago I heard of the tiny Himalayan region of Zanskar in the far North of India, which was completely cut off from the rest of the world during winter when the mountain passes were blocked by snow, except for a narrow river gorge whose waters froze, forming an icy highway link. For years slow progress has been made on a road to link Zanskar permanently to India all year round, but today, the road is still far short and the frozen river remains the only way to get in and out of Zanskar during the winter. There is a helicopter service but - as we were to find out - this is for emergencies only and the waiting list for non-emergency passengers is a long one. The frozen river is called the ‘chadar’ meaning blanket and i’ve just got back from hiking the chadar into Zanskar (and back out again) with a group of women gathered on Facebook. The Chadar and Zanskar has undoubtedly changed unrecognisably from the place I read about all those years ago but I was still blown away - like countless others before me - by the beauty of the place and the culture. I was also deeply grateful for the good company of the group, which goes to show that Facebook is not completely populated by axe-murderers and weirdos. The Himalayas now loom large in my daydreams and I’m already starting to plot other journeys in the region…here’s to future Momos! The non-axe-murderers of Facebook and our superstar Zanskari guide, Angla. The Explore weekend is always awesome - not just because I come away feeling re-motivated and re-inspired to do more and be better, but also because it is often the one and only chance each year to catch up with some friendly faces from the expedition community (as well as to meet with some new ones). This year was no exception. I enjoyed being on the Polar Panel alongside Steve Jones, Martin Hartley, Claire Grogan and Denise Martin. It was a particular treat to finally meet Denise who I have heard so much about thanks to all her legendary polar guiding but have never actually met before. It was interesting that this year, unlike previous years, the panel was asked more about Russia/Siberia and Greenland/Arctic Europe than it was about the High Arctic and Antarctica. On Thursday I was invited to the opening of Anita Corbin's '100 First Women Portraits' at the RCA Dyson Gallery in London. Anita has spent a decade travelling across the UK to photograph women who have been first in their fields and the exhibition has been timed to mark 100 years of women's suffrage in the UK. The result is an amazing collection celebrating the variety and depth of what women have been doing in the UK over the last 100 years. Walking around the exhibition I was struck by how recent some of the 'firsts' were and how fundamental. For me, it had the effect of highlighting just how far women still have to go as well as a demonstration of how far we've come. I can't recommend enough going to take a look. The exhibition is free to the public until 22nd August at the Dyson Gallery which is on the south side of Battersea Bridge. Anita has also produced a book of the portraits available at www.1stwomenuk.co.uk. It was such a privilege to celebrate the opening with so many of the first women - 62 of the 100 were there - great to see Sarah Outen and Rebecca Stephens, and to meet Beth French, Dany Cotton and so many other experts in their fields. Wonderful, uplifting evening. A loud THANK YOU to Tania and Bex of the Womens Adventure Expo for putting on an event at the Royal Geographical Society in the centenary year of suffrage in the UK to celebrate the long history of women in exploration. 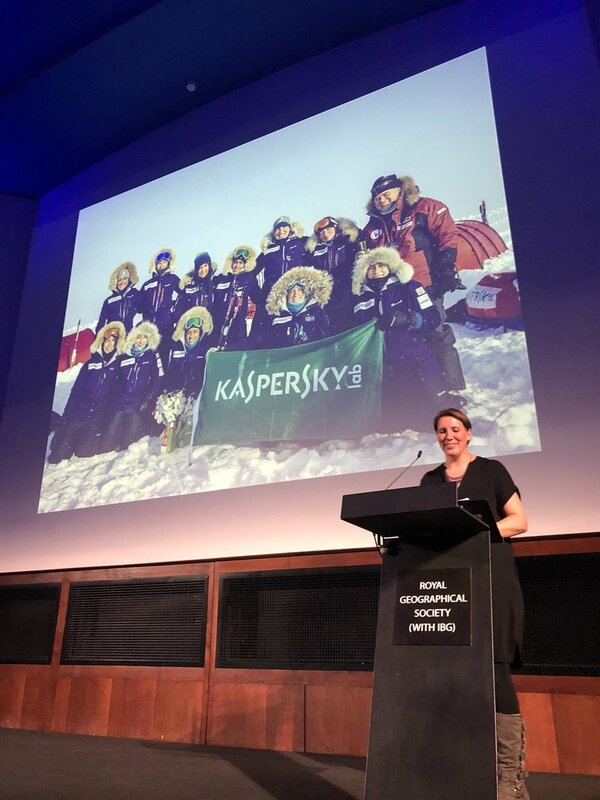 A day-long conference was followed by an evening event at which I was incredible grateful to be given the opportunity to talk about a subject I feel passionately about - the story of women in the polar regions. It is a surprise to many that the story of women in Antarctica for example, begins in 1773 - the same year Captain Cook first crossed the Antarctic Circle. Many of the women whose stories I share were not free to explore in their own right, but nevertheless they found ways to explore within the roles available to them (or sometimes trespassed into roles that were not open to them). Either way, they carved out their own relationship with the Polar Regions and left us with a rich heritage that is in itself worth exploring. The day was topped off by the appearance on stage of the Ice Maidens and my own Women's Euro-Arabian North Pole team. The Ice Maidens skied across Antarctica earlier in the year and although the Euro-Arabian journey was a lot shorter (! ), it felt unique to have a stage full of women who had been both North and South in the same year sitting together on stage at the Royal Geographical Society - I wonder whether anything similar has happened on that particular stage before? Fresh back from the North Pole! 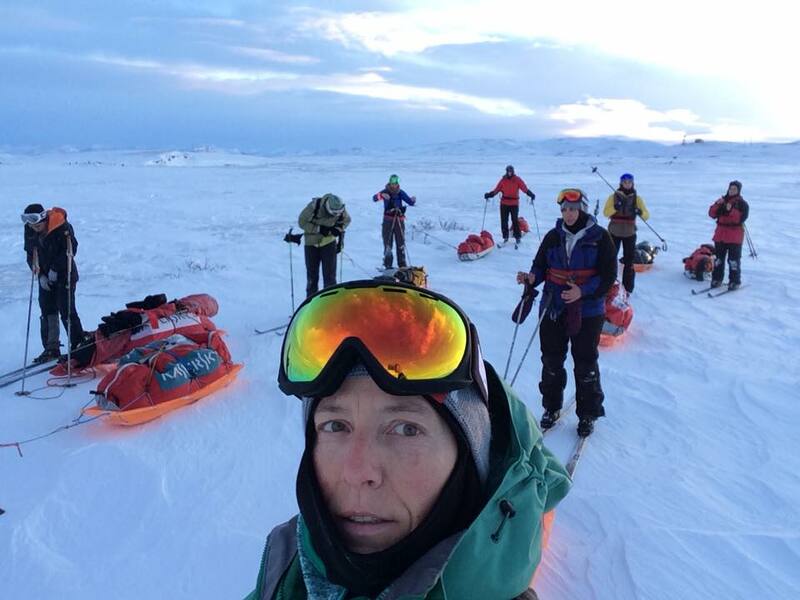 After two long years of preparation and delays, successes and setbacks, I finally stood at the top of the world alongside the 10 team members of the Women's Euro-Arabian North Pole Expedition on the 21st April. The sea ice of the Arctic Ocean was simultaneously intimidating and mesmerising. We saw such beautiful colours and incredible variety of ice formations and yet everywhere was the unnerving evidence that we were not on solid ground but a shifting, unpredictable raft of fragile ice. We saw open water steam into the freezing air and hang over the ice like a sinister mist, we saw vast boulders of ice balanced in heaps as if swept up by giant hands and once, on prodding the far side of a lead, I saw the seemingly solid ice move away from me frighteningly swiftly. I am used to expeditions that last weeks, that are all about making slow and steady progress - but the Arctic Ocean was the exact opposite of everything I was used to. We had a very short time window to complete our journey and from the moment we were deposited on the ice we were against the clock. Everything had to happen so quickly and the challenge was to be ready for that. No time to fall into routines or to adapt. I look forward to sharing the story and experiences of this expedition in the months to come - as always I learned a lot from those we travelled with, about mistakes made and things that I could have done better, as well as a reaffirmation that the human spirit is a wonderful thing to be admired. The team are each speaking about their personal journey in schools and at events, we are all writing up our memories and Holly has already begun the long process of editing expedition footage into a film. With things changing so rapidly in the high Arctic I feel very fortunate to have been able to experience it and I very much hope this won't be the last time I stand on the ice at the top of the planet. I've been here in Longyearbyen for a week and am already beginning to feel like a local - it doesn't take long to settle into such a small community and for faces to become familiar. Preparing for the Women's Euro-Arabian North Pole expedition later in the month, we have set up a temporary HQ on the last hunk of rock before the frozen expanse of the Arctic Ocean. There is a lot to do.....preparing equipment, sorting logistics for the arrival of the rest of the team, keeping sponsors and supporters in the loop and undertaking the initial tests for the science studies the expedition will take part in. 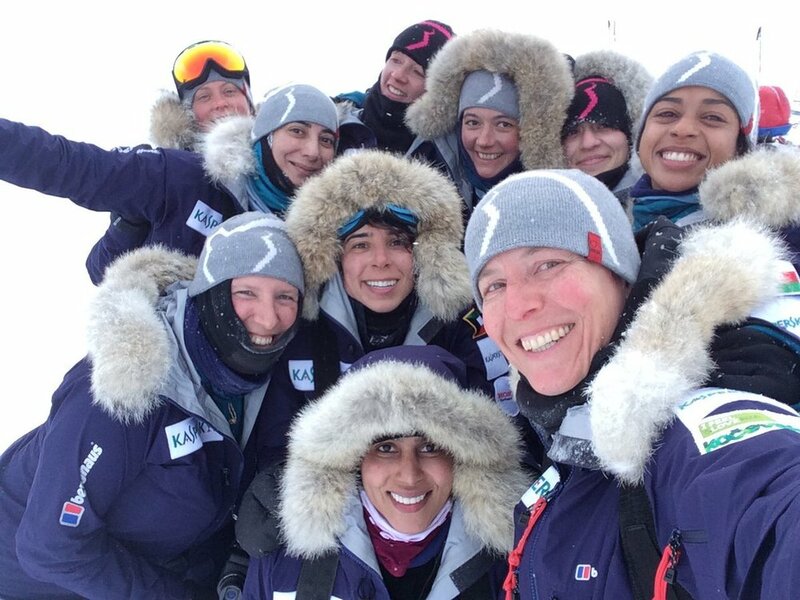 You can follow our progress on the expedition website and social media strands at @northpole2018. In between the feverish activity, it's been a real pleasure to spend time in this unique town - to see the light travel around the mountains that rise up on all sides - watching the lines of snowmobiles trail up the glacier every morning and return every evening - to hear the stories in the bars and coffee shops - and to catch up with the extraordinary friends that live here. Delighted to have presented the latest expeditions at the GLOBE Forum 2018 in Vancouver - a wonderful platform. The theme of the conference is 'Disrupting Business as Usual'. That is precisely what our Euro-Arabian Expedition aims to do by inspiring everyone to think twice about their perceptions. Lots of shock in the room about the precarious state of Arctic Ocean sea ice. My big takeaway from the conference came from Emily Penn's talk about ocean plastics. Of 39 toxins banned by the UN that come from plastic she found 27 present when testing her own blood. This coupled with the news today from the BBC that plastic fragments were found in all brands of bottled water sold within the UK has really hit home with me. How would you like to join Kaspersky Lab CEO Eugene Kaspersky on a unique trip to the North Pole? To commemorate Kaspersky Lab's support for the Women's Euro-Arabian North Pole Expedition, Kaspersky Lab are offering one EU citizen the chance to accompany Eugene when he meets and congratulates the expedition team at the finish line. The winner will be flown to Svalbard in the Arctic Circle, then to the remote Barneo ice camp at latitude 89 degrees North, before boarding a helicopter and flying to the geographic North Pole. The prize is valued at €20,000 and includes all travel, accommodation and meal expenses, as well as equipment hire. This is a very special once-in-a-lifetime experience. Win it, and you'll never forget it.. So if you're an EU resident, in good health, aged 18-years or older, and ready to fly between April 10 and 16 2018, enter now. It couldn't be easier to get involved! Look out for some dramatic tent-footage of a storm and the team courageously taking part in ice-breaking drills! I was very honoured to be presented with the 2017 Alumnus of the Year Award by the University of Reading today. I attended Reading between 1999 and 2000 to complete a Masters degree in Applied Meteorology. Recognition is always lovely but receiving this award was particularly wonderful because when I graduated from the University I wasn't able to attend the graduation ceremony - I was already on my way to Antarctica for the first time. So, today, it felt like I finally graduated - just 17 years late! Huge thanks to the Chancellor and everyone at the University who made the day special - but especially Professor Giles Harrison who gave a wonderful award speech. You certainly did your research! Last September I held the first training meet of the Euro-Arabian North Pole Expedition on Langjokull Glacier in Iceland. For the team's second training meet it seemed fitting that - having travelled to a European destination last time - we should this time head to the Middle East. Finding a suitable location for Polar training on the Arabian Peninsula might seem a hopeless prospect but Oman provided the perfect solution. We spent a week crossing the Wahiba Sands of Oman, a compact desert of bright red sand dunes a few hours drive from the capital. The heat was certainly a new challenge for a Polar team but in many other respects the skills demanded were ideal. From navigation to on-the-spot route finding, travelling together and learning to trust each other as a team - it was a perfect training ground. Oman also provided a white landscape to make us feel at home. A little further along the coast from the Wahiba Sands are the Sugar Dunes, a patch of desert so white that at first glance it could be snow and ice. As the team hauls sledges full of equipment in polar style, the only thing that gives it away in the photos are the t-shirts and bare feet! Very excited to have received a grant from the Society of Authors administered Authors' Foundation Grant. The funds will enable me to make a journey needed to finish off a book I have been working on for a while. However, I'm also deeply grateful for the belief in the project that the award of a grant implies. Thank you! I was really delighted to be asked by the RGS in London to give their annual lecture aimed at younger inquisitive minds. The 700 or so capacity Ondaatje Theatre at the RGS - with the names of legendary explorers etched in gold around the walls and a palpable sense of history - is always a pretty intimidating place to speak but I admit that a younger audience motivated me to prepare even more carefully than usual! My talk 'Freeze! Adventures through the coldest weather in the world' ranged from meeting the Lord Keeper of the Cold in the coldest inhabited place in the world, to travelling to the North Pole in a nuclear-powered icebreaker, to skiing through whiteouts in Antarctica. There were lots of really great questions from the audience at the end - which, I think, is always a good sign that everyone has enjoyed themselves and found something interesting at the same time. I certainly enjoyed meeting many of the young geographers afterwards, even if I did miss out on the squash and activities going on in the next room! You might remember that I disappeared off to the Yukon for a month back in May/June? Well, the BBC History three-part series we were filming is due to be broadcast on BBC Two over the coming weeks with the first episode airing tonight (Sunday 30th October) at 9pm. The remaining two episodes will be broadcast on Sunday 6th November at 9pm and Sunday 13th November at 8pm.